« Why are alternative practitioners so stubborn? I stumbled over an article entitled ‘The myths of homeopathy: Resounding answers‘. I thought it was great fun, so much so, that I copied it below – not just once but twice. The second time I took the liberty of replacing the little porkies told by homeopaths with the truth. Homeopathic medicines are not placebos! Little “pellets” of sugar cannot have an effect! Of course, the sugar in homeopathic pellets doesn’t have any effect. This is why we also have tablets and drops that contain homeopathic active substances. The sugar is simply a medium for these active substances. The important element is what has been added to the sugar – the active ingredient! As homeopathic remedies have very slow action, they cannot be used to treat acute illnesses! This is incorrect. You can successfully use homeopathy in acute circumstances such as infections, fevers and colds. Homeopathy seems to be a kind of magic! Homeopathy is not magic! Homeopathy is a field of medicine that has the capacity to heal, but if course, it has its limits, just like any other medicine, including conventional medicine. To give you a clear example – it’s unlikely that homeopathy will replace a surgical intervention. During homeopathic treatment you have to follow a strict diet! Well, it’s not such a bad thing…but of course, you need to eat healthily and avoid smoking, drinking alcohol and coffee. In some cases you can’t eat onion or garlic as they contain sulphur, which is a homeopathic remedy in itself. All of these things have little to do with a strict diet. Diabetes sufferers can’t use homeopathic remedies! This is not true. The amount of sugar in the pellets is negligible. These homeopathic pellets could even be taken on a daily basis. The foods we eat contain much more sugar, even those that are especially for diabetics. Of course, the sugar in homeopathic pellets doesn’t have any effect. And the drops added also contain no active substances. In other words, there is no active ingredient! This is correct. You cannot successfully use homeopathy in acute circumstances such as infections, fevers and colds. In fact, you cannot use it to cure any condition, chronic or acute. Homeopathy is not magic! It relies on the placebo and other non-specific effects, and that is no magic. Hahnemann gave very clear instructions to avoid a whole range of things while taking homeopathic remedies – otherwise, they don’t work, he claimed. This is as wrong as everything else Hahnemann said about homeopathy: these remedies don’t work whatever you do. This is not true. The amount of sugar in the pellets is negligible. These homeopathic pellets could even be taken on a daily basis. The foods we eat contain much more sugar, even those that are especially for diabetics. 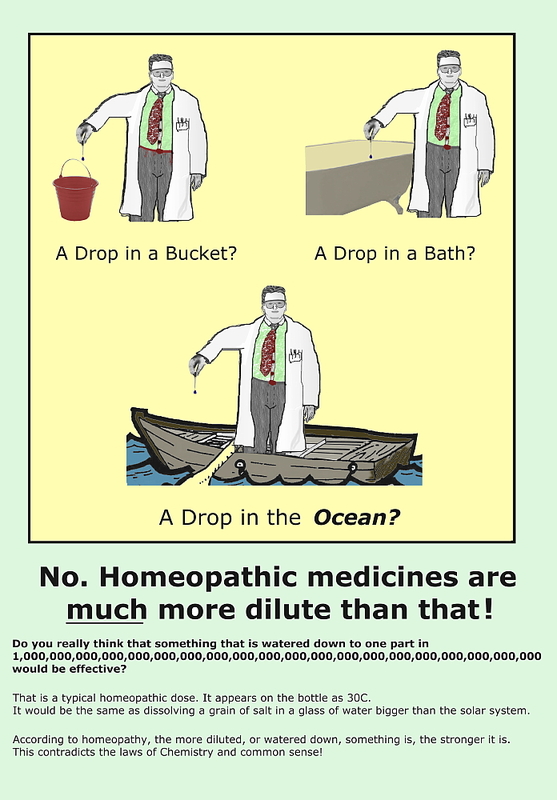 But that does, of course, not mean that diabetics ought to take homeopathic remedies. There is no reason why they should; these remedies are pure placebos. Few people reading these lines will be surprised that the ‘resounding answers’ turn out to be resounding lies. And what I above called ‘great fun’, turns out to be a serious deception. The fascinating thing here is, I think, the way homeopaths try to mislead the public: one seemingly innocent untruth about the ‘active substance’ is used as the basis for an entire house of cards. It tumbles at the slightest attempt to provide the facts. Sadly, many consumers do not know the facts and are therefore prone to fall victim of these resounding lies. TELLING LIES OF THIS NATURE IS UNETHICAL AND ENDANGERS THE HEALTH OF THOSE WHO DO NOT KNOW THE FACTS. The authors are as anonymous as the remedies they promote. This web site has no authority whatsoever and I can only assume is designed to gull folks onto its pages so they will be attracted to the adverts. In other words -it’s a click bait site. Leave well alone – even if you are a believer. (Perhaps, especially if you are a believer). – The situation improves? Great! It’s working! Keep on going (read: keep on paying me…)! – The situation gets worse? Don’t worry, we see it all the time, it’s a sure sign from your body that it’s doing something! Keep on going (read: keep on paying me…), and you’ll see improvement eventually! – Nothing seems to happen? That is quite normal – homeopathy is a very mild treatment, so it can take up to several months for any effects to materialize. So don’t give up, just keep on going (read: keep on paying me…)! – Oh, it’s been six months now, and still nothing happens? Well, I may have got the symptoms not quite right … but have good news for you: there are plenty more remedies we can try! So let’s schedule a full session once again to really get those symptoms sorted out (read: pay me even more…), and we’ll find the correct remedy, you just mark my words! … and this is how homeopaths keep sucking money out of their gullible customers. 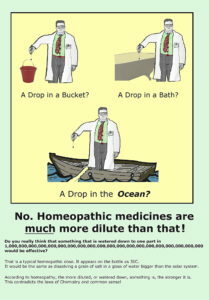 YES, BUT WITHOUT HOMEOPATHY YOU WOULD BE DEAD BY NOW!!! – Real doctors and medical scientists use their imagination and their powers of reasoning to determine what is actually wrong with patients and how to get them back to health. – Homeopaths use their imagination and their powers of reasoning to find explanations why their treatments don’t work, always carefully circumnavigating the real and central explanation: they CAN’T work. – “You put your cell phone near the remedy on the night stand? Sorry, but that won’t work, of course! The cell phone radiation interferes with the active ingredient! Quite often, they advise wrapping the remedies in tin foil to protect them from radiation etc….. I have a letter from a consultant physician working for the NHS (Bristol – paid c. £120,000.00 p.a.) who prescribed Pulsilata 30C for a NHS patient with trigeminal neuralgia. When it didn’t ‘work’ after two months he wrote to the GP saying he was now switching to Sulphur 200C! I know the NHS is now getting its act together, but it still goes on. The London Homeopathic Hospital still exists (with rebranding), and pays its medical staff from NHS funds. I bet its Director has even got a Clinical Excellence Award (which could double his salary, and pension). Why is Jeremy Hunt so gullible? Why cannot he be as honest as Simon Stevens (CEO of NHS). Can Mr Hunt be trusted at all?